My daughter is 16 and just about to get her driver’s license. She’s thrilled. I’m terrified. Don’t get me wrong, it’s not her. She does all the right stuff: Drives the speed limit, stops for a full three seconds when she’s supposed to, and doesn’t use her cellphone in the car. Still, I’m not sure I’m ready for this particularly risky milestone — and for good reason. The newly updated teen drivers report from the Centers for Disease Control and Prevention shows motor vehicle crashes as the leading cause of death for U.S. teens. And the latest data from the AAA Foundation for Traffic Safety shows that new teen drivers between the ages of 16 and 17 are a whopping three times as a likely as an adult to be involved in a deadly collision. 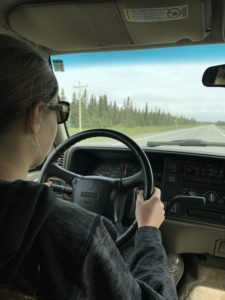 My daughter, Jeneva, practicing her driving on a long, straight stretch of road on a recent family vacation to Kenai, Alaska. So what gives? How can I try to make this particular right of passage a little less scary? The answer may very well lie in a slew of new teen tech driving tools, starting with car makers. Ford’s MyKey system has all kinds of custom settings for parents, including volume limits for the radio — so your teen isn’t rocking out when they should be watching the road — a “Belt-Minder” that chimes and mutes the speakers until the buckles click, and includes top speed limits that prevent the car from topping 65, 70, 75, or 80 mph. All of which makes sense, especially when the CDC says teens have the lowest rate of seatbelt use of all drivers. Chevrolet’s new built-in safety system called Teen Driver Technology works like a virtual coach that lives inside the car itself. It also sets speed alerts, volume limits for the radio, and parents can get an in-vehicle report card right on the dashboard display . 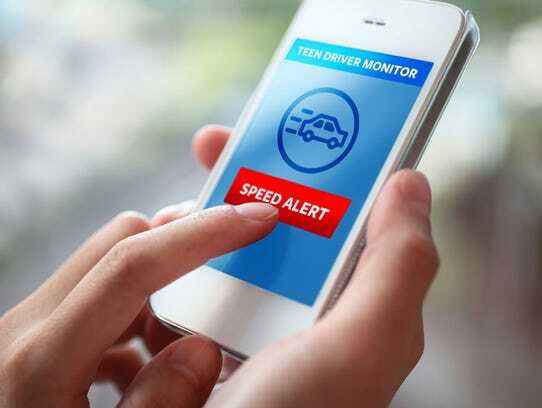 Apps like this will better assist you in coaching your teen to become a safer driver. It’s not just domestics that are jumping in with a helping hand for teen driver safety. Volkswagen’s connected car system, Car-Net, is also packed with fancy features that send apps from your smartphone right to your car dashboard, with some handy tools for parents, too. It has built-in emergency alerts in case of an accident, but it also lets you set alerts for both speed and location boundaries — so if your young driver decides they want to go on an impromptu road trip, you’ll know about it immediately — and the notifications get sent right to your phone. These are awesome, built-in teen driving solutions for new car shoppers, or people with newer models of these brands. But even if you’re driving an older car, like most kids to, there’s still plenty you can do to tech out your teen driver. License+ for iOS and Android acts like a driving tutor for teens and watchdog for parents. It works hand-in-hand with a little plug-in gadget called Automatic that you install on your car, and sends all kinds of useful data to the app using Bluetooth or 3G. It tracks acceleration, braking, speed, and other stats, and as the parent you can log into the License+ dashboard and see how they’re doing whenever you want. If you just want to check their driving stats occasionally, the $79.95 Automatic Lite is a good option, but if you want live updates and real-time tracking, you’ll need the $129.95 Automatic Pro, which includes five full years of 3G service so you won’t have to worry about any monthly charges. If you’re looking for app-only solutions you should consider Life360, which has a driver safety mode that tracks location and estimates speed and sends alerts for hard braking, rapid acceleration, and even crashes. There’s also AT&T’s Drive Mode app, which silences notifications as soon as it detects the person is driving to prevent distractions, and EverDrive, which passively monitors driving behavior and reports it along with a score, which can even win you prizes. Even Apple is taking things a step further with an update to iOS later this year that will enable a new feature called Do Not Disturb While Driving. It’s an automatic Do Not Disturb mode that detects when you’re in the car and silences notifications from apps and texts that could break the concentration of the person behind the wheel. If someone texts you while the mode is active, your contact will get an alert saying you’re driving and will get back to the person as soon as possible. For emergencies, the sender can insist that the message go through, but it’s a nice extra wall of security between a pointless text message and the pavement. And if you want to really tech-out your teens before they even get their license, you can get them ready well in advance with a new online VR driver’s ed classes from Aceable. It has a slightly cartoony look, but it’s a great tool to teach and test braking skills, parallel parking, and basic driving rules like right-of-way and driving etiquette.